Composting can be categorized into different categories depending on the nature of decomposition process. 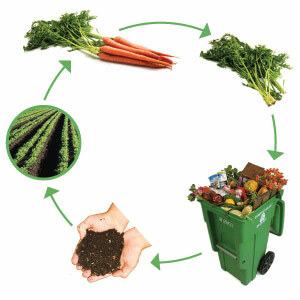 The three major segments of composting are anaerobic composting, aerobic composting, and vermicomposting. In anaerobic composting, the organic matter is decomposed in the absence of air. Organic matter may be collected in pits and covered with a thick layer of soil and left undisturbed six to eight months. Anaerobic microorganisms dominate and develop intermediate compounds including methane, organic acids, hydrogen sulphide and other substances. The process is low-temperature, slow and the compost formed may not be completely converted and may include aggregated masses and phytotoxic compounds. Aerobic composting is the process by which organic wastes are converted into compost or manure in presence of air. In this process, aerobic microorganisms break down organic matter and produce carbon dioxide, ammonia, water, heat and humus, the relatively stable organic end-product. Although aerobic composting may produce intermediate compounds such as organic acids, aerobic microorganisms decompose them further. The resultant compost, with its relatively unstable form of organic matter, has little risk of phytotoxicity. The heat generated accelerates the breakdown of proteins, fats and complex carbohydrates such as cellulose and hemicellulose. Hence, the processing time is shorter. Moreover, this process destroys many micro-organisms that are human or plant pathogens, as well as weed seeds, provided it undergoes sufficiently high temperature. Although more nutrients are lost from the materials by aerobic composting, it is considered more efficient and useful than anaerobic composting for agricultural production. There are a variety of methods for aerobic composting, the most common being the Heap Method, where organic matter needs to be divided into three different types and to be placed in a heap one over the other, covered by a thin layer of soil or dry leaves. This heap needs to be mixed every week, and it takes about three weeks for conversion to take place. The process is same in the Pit Method, but carried out in specially constructed pits. Mixing has to be done every 15 days, and there is no fixed time in which the compost may be ready. Berkley Method uses a labor-intensive technique and has precise requirements of the material to be composted. Easily biodegradable materials, such as grass, vegetable matter, etc., are mixed with animal matter in the ratio of 2:1. Compost is usually ready in 15 days. Vermicomposting is a type of composting in which certain species of earthworms are used to enhance the process of organic waste conversion and produce a better end-product. It is a mesophilic process utilizing microorganisms and earthworms. Earthworms feeds the organic waste materials and passes it through their digestive system and gives out in a granular form (cocoons) which is known as vermicompost. Earthworms consume organic wastes and reduce the volume by 40–60 percent. Each earthworm weighs about 0.5 to 0.6 gram, eats waste equivalent to its body weight and produces cast equivalent to about 50 percent of the waste it consumes in a day. The moisture content of castings ranges between 32 and 66 percent and the pH is around 7. The level of nutrients in compost depends upon the source of the raw material and the species of earthworm. Apart from other nutrients, a fine worm cast is rich in NPK which are in readily available form and are released within a month of application. Vermicompost enhances plant growth, suppresses disease in plants, increases porosity and microbial activity in soil, and improves water retention and aeration.